Samuel F. B. Morse sent a telegram saying "What hath God wrought?" as he formally opened America's first telegraph line, between Baltimore, Maryland and Washington, DC. C. H. F. Peters discovered asteroid #131 Vala. Born, Hans F. Gruene, German/American rocket engineer, as of 1960, Deputy Director, Launch Operations, NASA Marshall Space Flight Center. J. Comas Sola discovered asteroid #1117 Reginita. C. Jackson discovered asteroid #1195 Orangia. H. Van Gent discovered asteroid #1385 Gelria. Igor Sikorsky accomplished the first successful helicopter free flight, in Stratford, Connecticut. The US Navy launched the Viking 11 re-entry vehicle test flight, the first rocket to attain 150 mi (241 km) altitude from White Sands, New Mexico, as a re-entry nose-cone heat transfer experiment, and for photography research. The DRG (German Rocket Society) launched twelve of their small mail rockets from Vienna (Wien-Aspern) with 5000 postcards aboard. NASA launched Explorer S45A which was unable to achieve orbit because the Juno II second stage failed to ignite. With the launch of Mercury Atlas 7 ("Aurora 7"), Scott Carpenter became the second American to orbit Earth. 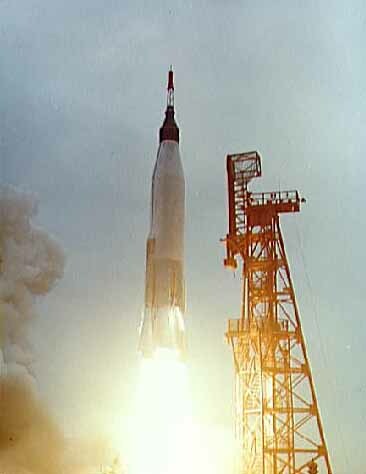 Mercury Atlas 7 (MA-7, popularly known as "Aurora 7"), launched 24 May 1962, was the second orbital flight of an American rocket with a human on board. M. Scott Carpenter was assigned to fly the mission after a medical examination of Donald K. ("Deke") Slayton, the originally scheduled pilot, revealed an irregularity in his heartbeat. The objectives of MA-7, similar to those of MA-6, were to: (1) evaluate the performance of a man-spacecraft system in a three-orbit mission; (2) evaluate the effects of space flight on the astronaut; (3) obtain the astronaut's opinions on the operational suitability of the spacecraft systems; (4) evaluate the performance of spacecraft systems replaced or modified as a result of previous missions; and, (5) exercise and further evaluate the performance of the Mercury Worldwide Network. Originally scheduled for launch in early May, the mission was postponed three times, once (7 May) due to check Atlas launch vehicle problems, once (17 May) for modifications to the altitude sensing instruments in the parachute deployment system, and finally (19 May) due to detected irregularities in the temperature control device on a heater in the Atlas flight control system. During the flight, only one critical component malfunction was encountered: A random failure occurred in the circuitry associated with the pitch horizon scanner, which provided a reference point to the attitude gyros. There was also concern about excessive fuel usage resulting from extensive use of the high thrust controls and the inadvertant use of two control systems simultaneously. To compensate for this, the spacecraft was allowed to drift in attitude for 77 minutes beyond the time already built into the flight plan. Two experiments were on-board MA-7. One was a balloon, deployed and inflated to measure drag and provide visibility data. The other was a device to study the behavior of liquid in a weightless state. The balloon experiment failed when it did not properly inflate on deployment, but the liquid experiment behaved as anticipated. A curious event during Glenn's (MA-6) flight was his report of "fire flies" when he entered the sunrise portion of an orbit. Although this phenomenon was a mystery at the time, it was resolved during Mercury Atlas 7 when Carpenter accidentally tapped the wall of the spacecraft with his hand, releasing many of the so-called "fire flies". The source was determined to be frost from the reaction control jets. During the flight, the spacecraft attained a maximum velocity in excess of 28,000 km/hour (17,400 mph) and an altitude of about 267 km (166 miles). The capsule reentered after completing three orbits, coming down in the Atlantic Ocean about 200 km (125 miles) northeast of Puerto Rico at 19 degrees 29 minutes N, 64 degrees 05 minutes W, about 400 km (250 miles) beyond the planned impact point. The overshoot was traced to a 25 degree yaw error at the time the retrograde rockets were fired. Retrofire was also about 3 seconds late, which accounted for about 32 km (20 miles) of the overshoot. The duration of the flight was 4 hours 56 minutes and 5 seconds during which Carpenter travelled over 121,600 km (75,560 miles). After the retrorockets were fired, computers at NASA's Goddard Space Flight Center successfully predicted the splashdown area, and naval ships and aircraft were deployed to the new location. An Air Rescue Service SA-16 amphibian aircraft was the first to establish visual contact with the spacecraft some 39 minutes after splashdown, with the USS Farragut being the first ship to reach the area. Carpenter was picked up after 2 hours and 59 minutes in the water and returned by helicopter to the aircraft carrier USS Intrepid. He experienced no adverse physical or biomedical effects due to the flight. The Mercury capsule was not retrieved until about 6 hours later when special equipment on the USS John R. Pierce arrived to retrieve it. USSR launched Cosmos 119 into orbit for investigation of the upper atmosphere and outer space. NASA launched IMP-F (Explorer 34) into orbit from Vandenburg Air Force Base, California, to obtain radiation and magnetic field data. USSR launched the Molniya 1-5 communication satellite into orbit from Baikonur for further development and experimental operation of long-range two-way television and telephone-telegraph radio communication. NASA's Echo 1, the first successful communications satellite, re-entered the Earth's atmosphere. After 31 Lunar orbits, the Apollo 10 CSM rockets were fired for the trans-Earth injection to bring astronauts Stafford, Young, and Cernan home from the final "dry run" mission prior to the first manned Lunar landing. USSR launched Soyuz 18 from the Baikonur Cosmodrome, with cosmonauts Kilmuk and Sevastyanov aboard, to the Salyut 4 space station. Soyuz 18 was a manned Soviet mission launched 24 May 1975 from the Baikonur Cosmodrome. The flight crew consisted of Cosmonauts Kilmuk and Sevastyanov. Soyuz 18 docked with the Salyut 4 space station for joint experiments with the Salyut scientific orbital station. The crew remained aloft aboard the station during the Apollo-Soyuz Test Project joint flight, and set Soviet record for time in space. Soyuz 18 was recovered on 26 July 1975 after 63 days in space when it landed 56 km east of Arkalyk. USSR launched the Ekran 15 communication satellite for transmission of Central Television programs to a network of receivers for collective use. It was positioned in geosynchronous orbit at 99 deg E in 1986-1988. The 20,000th manmade object to orbit the Earth was launched, the Soviet Cosmos 2021 variation of the Yantar-class spacecraft used to conduct high-precision topographic surveys. An aerobraking maneuver was started to circularize the orbit of NASA's Magellan spacecraft, revolving around Venus on a mapping mission. During the 5h 20m Mir EO-21-2 extravehicular activity (EVA), cosmonauts Yuri Onufriyenko and Yuri Usachyov deployed the MCSA solar array on the Mir space station. The Galaxy 9 communications satellite was launched from Cape Canaveral. It was positioned in geosynchronous orbit at 123 deg W in 1996-2000; and at 127 deg W starting in 2000. NASA's STS 84 (Atlantis 19, 84th Shuttle mission) landed after the sixth Shuttle-Mir docking mission. NASA's launch of STS 84 on 15 May 1997 occurred on time following a smooth countdown. The sixth Shuttle-Mir docking was highlighted by the transfer of the fourth successive US crew member to the Russian Space Station when astronaut Mike Foale exchanged places with Jerry Linenger, who arrived at Mir on 15 January with the crew of STS 81. Linenger spent 123 days on Mir and just over 132 days in space from launch to landing, placing him second behind US astronaut Shannon Lucid for most the time spent on-orbit by an American. Another milestone reached during his stay was the one year anniversary of a continuous US presence in space that began with Lucid's arrival at Mir on 22 March 1996. Other significant events during Linenger's stay included the first US-Russian space walk: On 29 April, Linenger participated in a five hour extravehicular activity (EVA) with Mir 23 Commander Vasily Tsibliev to attach a monitor to the outside of the station. The Optical Properties Monitor (OPM) was to remain on Mir for nine months to allow study of the effect of the space environment on optical properties, such as mirrors used in telescopes. On 23 February, a fire broke out on the 11 year old station. It caused minimal damage, but required station's inhabitants to wear protective masks for about 36 hours until the cabin air was cleaned. Besides Linenger, crew members aboard Mir at the time included two Mir 22 cosmonauts and a German cosmonaut, and two Mir 23 cosmonauts. STS 84 docked with Mir on 16 May above the Adriatic Sea. Hatches between two spacecraft opened at 12:25 am EDT, 17 May. Greetings were exchanged between the STS 84 crew and Mir 23 Commander Vasily Tsibliev, Flight Engineer Alexander Lazutkin and Linenger, followed by a safety briefing. Linenger and Foale officially traded places at 10:15 am EDT on 17 May 1997. Transfer of items to and from Mir proceeded smoothly and was completed ahead of schedule. One of first items transferred to the station was an Elektron oxygen generating unit. Altogether, 249 items were moved between the two spacecraft, and about 1,000 pounds of water moved to Mir, for a total of about 7,500 pounds of water, experiment samples, supplies and hardware. The research program planned for Foale during his stay aboard Mir featured 35 investigations (33 on Mir, two on STS 84, with a preflight/postflight component) in six disciplines: advanced technology, Earth observations and remote sensing, fundamental biology, human life sciences, space station risk mitigation, and microgravity sciences. Twenty-eight of these were conducted during previous missions and were to be continued, repeated or completed during Foale's stay. Seven new experiments were planned in biological and crystal growth studies and materials processing. Undocking occurred on 21 May. Unlike prior dockings, no flyaround of the station by the orbiter was conducted, but the orbiter was stopped three times while backing away to collect data from a European sensor device designed to assist future rendezvous of a proposed European Space Agency resupply vehicle with the International Space Station. Other activities conducted during the mission included investigations using the Biorack facility, located in the SPACEHAB Double Module in Atlantis' payload bay, a photo survey of Mir during docked operations, environmental air samplings and radiation monitoring. STS 84 ended 24 May 1997 when Atlantis landed on revolution 144 on Runway 33, Kennedy Space Center, Florida, on the second KSC opportunity after being waved off from the first due to low clouds in the vicinity. Orbit altitude: 184 statute miles. Orbit inclination: 51.6 degrees. Rollout distance: 8,384 feet (2,555 meters). Rollout time: 51 seconds. Mission duration: nine days, five hours, 19 minutes, 56 seconds. Miles traveled: 3.6 million. The flight crew for STS 84 was: Charles J. Precourt, Mission Commander; Eileen M. Collins, Pilot; Jean-Francois Clervoy, (ESA) Mission Specialist; Carlos I. Noriega, Mission Specialist; Edward T. Lu, Mission Specialist; Elena V. Kondakova, (RSA) Mission Specialist; C. Michael Foale, Mission Specialist (returned on STS 86); Jerry M. Linenger returned from Mir (launched on STS 81). The Telstar 5 communications satellite was launched from Baikonur on a Proton booster, and positioned in geostationary orbit at 97 degrees W longitude. The Eutelsat W4 communications satellite was launched from Cape Canaveral on the maiden flight of the Atlas IIIA booster. Eutelsat W4 was launched 24 May 2000 on the maiden flight of the Atlas IIIA rocket, its flight had been scrubbed four times. It was a European Telecommunications Satellite Organization (Eutelsat) satellite equipped with 32 Ku-band transponders, and antennae covering Russia and Africa, stationed at 36 deg E longitude. This was the third of the high power Eutelsat W series to be launched (W1 was destroyed in a ground accident). Eutelsat W4 was positioned in geosynchronous orbit at 32 deg E in 2000. As of 4 September 2001, it was at 35.98 deg E, drifting at 0.003 deg E per day. China launched the Beidou 1C navigation technology satellite from Xichang on a Long March 3A.